In December 2008 the long-awaited film about Chess Records premiered in the U.S. So I went to amazon and ordered the DVD when it became available two weeks ago. Click here for the corresponding amazon pages. Of course the DVD did not play in my DVD player as the DVD is region coded fot the U.S. and Canada. I really, really do not understand what line of reasoning is behind limiting audience and market of a DVD and movie, but Sony will know. To watch the U.S. DVD you need to have a region-free DVD player. I use a computer for such. 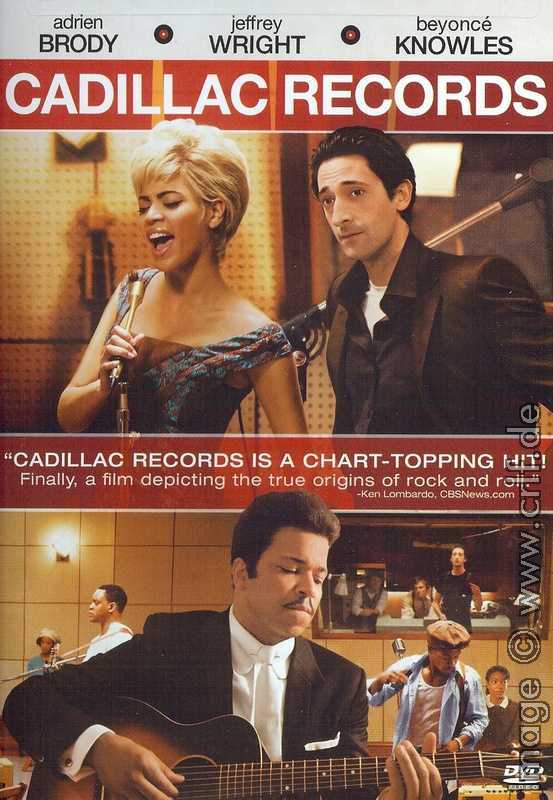 As you will have read otherwise, Cadillac Records tells the story of the Chess record label in Chicago. Of course, a movie has to concentrate on excerpts from a 15 year story. So the producers took some liberties in removing characters and in highlighting others. The main characters in the movie are Leonard Chess, Muddy Waters, Little Walter, Howlin' Wolf, Chuck Berry, and Etta James. Bo Diddley is not noted at all, and even Phil Chess is never mentioned by name, if I watched carefully. The DVD has a deleted scene in which Phil at least is introduced. If you are not familiar with the Chess story, chances are low you will want to watch the movie. But if you are interested in Chuck Berry's music, the Chess story is an important part thereof. So I recommend you have a look on the movie. But I recommend much more that you read the books on Chess Records, especially the one by Nadine Cohodas Spinning Blues into Gold. Unfortunately the writers of the movie did not use Cohodas' book but went more for Rich Cohen's Machers and Rockers. As I write in this site's chapter on Berry-related books, Cohen's book concentrates on the two characters of Leonard Chess and Muddy Waters and is full of errors and omissions. And likewise Cadillac Records concentrates on the characters of Leonard Chess and Muddy Waters and is full of errors and omissions. Sigh! What interests us the most is Chuck Berry's role in the movie. Berry is played by Mos Def, or Dante Terrell Smith, musician and actor. I have never thought of Mos Def as a Rock'n'Roller, so his performance as Berry is surprising - and surprisingly good! There are three or four acting scenes and a number of on-stage performances mainly to show that Chess and Berry took down the barriers between C&W and Blues, between Black and White. Mos Def plays Berry as a musician and comedian, which may come close to the truth in the 1950s. There's a funny scene where Berry and Chess visit Alan Freed, and there's a scene in which Berry is refused to perform because the promoter thinks of Berry as a white Country artist. This story is also told by Berry himself in his Autobiography, so it may have happened. But if it did, it definitely happened after Berry got national attention with his first Chess hits. In the movie this scene takes place before Berry joins Chess. One of many factual errors. The errors continue in the selection of Berry titles in the movie. The writers have known that Maybellene was Berry's first Chess hit. So Mos Def plays it, and quite good. But all the other songs Mos Def performs before Berry's first imprisonment are completely wrong: No Particular Place to Go, Promised Land, and Nadine (of which only the intro is heard) have all been recorded five to ten years later than when they appear in the film. That's poor. It's interesting to note that the Deluxe version of the soundtrack album (see here) also contains Mos Def's cover of Come On which did not make it into the movie. You can use the amazon MP3 widget below to hear excerpts of Mos Def's cover versions. If you buy the DVD, don't forget to watch the extra features. I found the film about costumes and design most interesting. All the sets are very well made to show the 1950s, so that's reason enough to watch the movie - and to see Mos Def play Chuck Berry.